Just thought I would show you a little of what is going on in my house this week...its just another week full of building and painting...but I am super excited about this project! So this week, after my sweet hubby gets home from his super-stressful, manly-man job...he gets to unwind and relax by spending a little quiet time with his tape measure and table saw. I am forever grateful he loves to do these things for me, and even more grateful one of us took math class seriously in high-school. I think there would be a few frustrated freak-outs if I was really the one that had to build it. Hopefully, by the weekend I will be painting my gorgeous Pottery Barn inspired...but waaaaay less expesive desk for my newly renovated home office. Oh, and just in case he gets my desk done a day early...I have drawn out the plans for one of these, too! I have a wall in my kitchen just waiting for this. 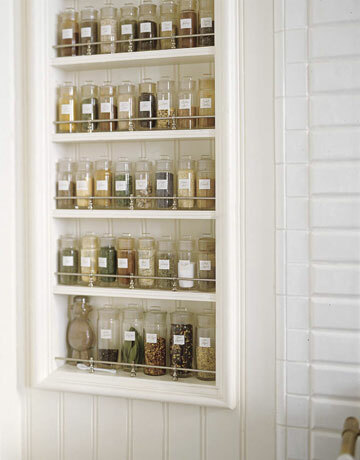 Each night, about 5:30, my husband hears me complaining about my train-wreck of a spice cabinet and how I can't find a freakin' thing in it! So I am sure he will be happy to accomodate. LOVE handy husbands! Can't wait to see the finished product(s). LOVE handy husbands! Can't wait to meet mine! hee hee...thank you, Shannan. I'm looking forward to seeing your new desk and cabinet. The inspirations are just lovely! Well aren't you lucky!! How great that you have a hubby both willing and able to build cool stuff for you :) Make sure you show us a pic!! Can I borrrow your hubby for a week? I can't cook...though...hmmm, uh oh...he probably won't come for free, huh? Darn it...i can't wait to see what you come up with..I love that desk too, and like you wouldn't pay the price for it. You better show some photos...missy! Sigh* * love that desk too! Handy hubs are the best. I adore mine & request "projects" out of him often. I even have a project list he hates! Thank goodness we can cook to pay them back!! Can't wait to see the finished desk!! That's so funny...I had my hubby build me a 9 foot desk that I painted white and skirted the bottom with burlap...to hide the ugly storage drawers...and I absolutely love it. Hope you'll share some pics of it when it's done.